"...What surprised me were the boxes of bullets that had belonged to the Germans. They were wooden-head bullets painted green. When they hit a body, they burst into slivers and the paint caused infection. So it did not make any difference where you got hit, as you were knocked out of action from the infections..."
I will try to put into writing my experiences in World War II over 35 years ago. I know that I won't remember it all. Some names, dates, and places are out of my mind forever. Others will never leave me. Men my age signed up for the draft back in the early 1940's. I was put in Class 3A, which is the same for a married man as 1A was for a single man. Some men received deferments from their place of work if their employer could prove they were needed for war material production. Some men tried to get a 4F rating at their physical examinations by rubbing soap under their armpits, which gave them high blood pressure temporarily. I was hoping for a deferment, but at the same time I felt I had to do my duty. There was nothing wrong with me physically except for flat feet. (The flat feet disappeared after I was discharged from the service. All that walking in those G.I. boots cured them.) At my physical examination, the ear doctor probed in my ear too much to the extent that it bled badly. In October 1943, I received my "Greetings" and was called in for my induction. After having the examination, they stamped my hand Navy. I didn't like that at all. I told them that as long as I was going in to serve my country, I would like to be on solid ground. They were very obliging and wiped off the Navy and stamped on Army instead! From there I went to the Army room and was inducted with the rest of the men who were slated for the Army. They put us on buses and took us to Fort Sheridan, Illinois. When we got off the bus, the soldiers at the fort were smiling at us and yelled, "You will be sorry!" as they marched past us. The barracks were all filled, so we were quartered in tents for three days. The next Sunday we were allowed to have our families visit us, which was wonderful. My wife El, son Glenn, and my in-laws came out for the day. We had a nice afternoon together. By that time, we had been issued our orders and G.I. clothing. None of the clothes fit but the Supply Sgt. said, "Wear them." The only way we could get different ones was when they were worn or torn. The next day there were a lot of torn clothes and we were able to ask for clothes by the proper size. By Tuesday, they had me listed with a group going to Camp Blanding in Florida. The training there was very extensive and rugged. We had to run for two miles every morning before breakfast. The meals were very good. You got as much as you wanted to eat, but you had to eat all you put on your plate. Our days were divided by field exercises and field classes. We learned how to crawl through sandy grass or swamp. In between we sat and listened to the instructor. We were taught the use of the rifle first and after that we became a heavy weapons company. We were taught to be accurate with the mortar, bazooka, and the 30 and 50 caliber machine gun. We learned to be very accurate with calling yardage for a target hit. We always had a long march with full pack to our training areas. They increased the distance gradually each day from 1 mile to 10 miles. We sure had a lot of blisters until we got used to it and learned how to break in our boots. We soaked them in a bucket of water overnight and put them on wet the next morning. That way they formed to our feet and felt real good. We did a lot of drill marching every day along with calisthenics and obstacle courses. By the time we graduated, we were in very good physical condition. I was made Acting Platoon Sgt. of our company in training. There was a regular Sgt. but I followed all his instructions. When we finished our basic training, all those who were Acting NCO's would be promoted to the rank they were in and would go overseas as a unit. But that was not meant to be for me. We were to complete our training in January, but I became ill late in December after a long hike in freezing rain. I was hospitalized with high fever and an ear infection for three weeks (the same ear that the doctor had probed too deeply at my induction). When I came out of the hospital, it was too late to return to my old outfit as they had graduated. I was put in another outfit that had the same amount of time in as I had. I now know that I was very fortunate not to have gone overseas with my first outfit, as they were in the first wave at Anzio Beach and were cut to ribbons. All the while that we were in training, I constantly wondered if I would really be able to kill when the time came. It bothered me especially when we had bayonet training. Our instructors always said that we should learn to love that weapon as it was our last resort. By then I convinced myself that I could shoot anyone in front of me or that was coming at me, but would not shoot at anyone running away from me or that had tried to surrender. I lived by that rule as much as I could. In March, El and 13 month-old Glenn came to Florida to be with me. They stayed at a motel and I was only able to see them from Saturday afternoon until Sunday. I would show El the different things I had learned. One weekend I showed her what judo was: what to do for protection, how to use the hip and grab the arm to throw the other party on the ground. She tried it on me after I had demonstrated it to her, and that was my mistake. I didn't expect her to pull my arm and throw me off balance the way she did. I went sailing over her hip and shoulder and banged against the wall. I wonder what the people in the next room thought. And she hasn't been afraid of me since! Later when we were in bivouac in our final stage of basic training, I was called back to camp and asked if I wanted to join the Canadian army. I was surprised and puzzled and asked them why. I had become a U.S. citizen in 1939 soon after El and I were married. They said that since I was Canadian-born, I had the choice to fight for either country. I told them I would stay where I was, as I was a U.S. citizen now. They then took me back to the bivouac area. Once there, we started a long march (25 miles) back to camp carrying full pack plus weapons. Before we ever got near the camp, we had blisters on our feet and could hardly walk. When we neared the camp gates, the band was playing various military marches. Everyone snapped to attention and seemed to walk with light feet again. That evening most of us were soaking our feet and applying bandages. Two days later we graduated from Basic and were given a week's furlough. After spending that week at home in Chicago, it was time for me to report back to Fort Sheridan. We soon were on a train heading for Ft. Meade, Maryland. On that train, I became acquainted with Larry Scialabba whom I was to spend much time with. I noticed that he had a seizure sitting in his seat and wondered how a man like that could get past the physical examinations. While at Ft. Meade, I got to see my brother-in-law Fred Bruchs one afternoon, as he was stationed there. From there we were sent to Camp Kilmer in New Jersey. It was an embarkation camp. While at Camp Kilmer, we were given one afternoon and evening to go to New York City before boarding the ship to go overseas. I went to Rockefeller Center, walked down 5th Avenue, and then went to 42nd Street. Three of us G.I. 's visited a bar/restaurant and had a sandwich and a beer. The floorshow was on at the time. After the music stopped, the girls came off the stage and joined the audience asking for servicemen to come up on the stage to do the Boopsy Daisy. They coaxed me to come up there, but I didn't want to, as the only dance I could do was the waltz. But somehow they got me up there and I really did the Boopsy Daisy. I was so clumsy wearing the big G.I. boots that I accidentally stepped on their toes but good. I bet they were more careful who they asked after that! The next day we boarded ship. It was an old Limey tub, an English freighter turned troop ship. The crew and food were English also. There were no bunks or hammocks. The next ten days I ate off the dining room table and slept on the same table at night. It was sleep on the floor or wherever you found room to lie down. The trip was rough. At times when I stood at the railing, the water would wash across the deck and the next minute the water would be way down at the bottom of the ship. We were in a big convoy with ships all around us. The men played a lot of cards. One man got very lucky in a crap game and he won a lot of money. He hired two of the men as bodyguards for the rest of the trip. One had to stay awake while the other slept for fear of someone taking his winnings. Otherwise, the trip was uneventful. When we reached the English Channel, we received the alert warning that u-boats were in the vicinity, but luckily nothing happened. It was beautiful going along the English coast in the Channel. We saw the White Cliffs of Dover, then turned right and sailed along between England and Ireland. The coast of Ireland looked so nice with its little white farmhouses and sheep grazing on green fields. We landed in Glasgow, Scotland and went right from the ship to a train. Little flocks of red-headed children followed us saying, "Any gum, chum?" We gave them what candy and gum we had. On the train, we went through Scotland, Wales, and on to southern England. We spent three days in a camp outside of South Hampton. There we received our rifles, which were still wrapped in wax paper. The rifles were coated with cosmoline grease and it took us all day to clean them. This camp was on Lord Nelson's estate. It had beautiful grounds with a huge home in the center on top of a hill. Staying there was expensive for the U.S. Army as we had to pay for every tree or shrub damaged even if only a branch was broken. On the third day, we boarded trucks and were taken to South Hampton where we were loaded onto ships to cross the Channel. It was a rough crossing. It was a moonless night and we bumped into another ship, but luckily no one was hurt. Our bow was broken and the other ship had a hole in its side, but both managed to stay afloat. Early in the morning, we were supposed to go overboard with rope ladders into a landing craft which was to take us to shore. The waves were so high that when you were on the ladder and wanted to step into the landing craft, you would find the craft 20 feet below your foot. After two soldiers fell, they gave it up and waited until noon when the wind had subsided a little. That afternoon was the first time I set foot on French soil. We landed at Omaha Beach several days after the D-Day invasion, which took place June 6, 1944. There were sunken ships and smaller crafts all along the shore. We saw tracer bullets with shells exploding and endless flights of planes overhead. That was when the long nightmare started for me. Until then it had seemed like an adventure, but now it was for real. We saw our first bunkers from the Siegfried Line and the spoils that they had left behind. What surprised me were the boxes of bullets that had belonged to the Germans. They were wooden-head bullets painted green. When they hit a body, they burst into slivers and the paint caused infection. So it did not make any difference where you got hit, as you were knocked out of action from the infections. We spent a few days in a replacement depot waiting to be assigned to an outfit. Then we started inland to follow the Front as it moved along. It turned out to be a different kind of fighting than we had been trained for. The land in Normandy, France was divided into several acre squares with hedgerows about 6 feet high. The hedgerows were mounded dirt with shrubbery on them. We had to fight from hedgerow to hedgerow, throw grenades over the top, and then hurry over to destroy what was left. Then we moved on to the next hedgerow. That was what we did for the next few days. Later a Sgt. invented a way for the tanks to get through the hedgerows. They put a V-shaped plow on the front of a tank and burst right through going at full speed. afternoon and evening. They wanted to get a taste of Paris nightlife. I was glad that I didn't go after the tales they told me when they got back. Next we went to the Belgium border. After that, I didn't see much of Larry anymore as I was in a rifle company and he was with heavy weapons. I later heard that they had to put Larry behind a tree until he was over his seizures, and then he had to catch up with his company. We were put in the 60th Regiment of the 9th Division (1st Army). They took us to the edge of some woods and the truck drivers would go no further, as the Germans were only about a mile away. We were all standing there in a group wondering what would happen next. A lot of men emptied their pockets of things they didn't want to be found dead with. After a while, a Sgt. came and took us to the Company area. A company normally holds 200 men but there were only 42 men there. The others were wiped out. Only the Platoon Sgt. was left. Three of the new men were made Squad leaders and I was made Staff Sgt.. The Sgt. said that it would be my job to see that the men had ammo, clothes, etc., and to bring up the rear and push the stragglers. So I went from Private to Staff Sgt. and missed PFC, Corporal, and Sgt.. We were taken out on patrol for the next few days to get us acquainted with the area. Then we started moving forward and pushed through Belgium without causing too much destruction to the Belgium cities. We used mostly grenades and rifles. I remember the first real battle we were in. We had moved with all kinds of artillery and tanks along a road on the rim of a deep gorge. Then all of a sudden, the Germans started shelling us. That's when we foot soldiers ran into the woods and attacked the Germans. Was I ever scared to see all those shells bursting around me. Some of our men were flying through the air. I ran for about 2 miles and had not fired even one shot. When I realized what I was doing, I started to shoot too. We moved forward until dark and then we dug shallow foxholes. There was one German out there calling for help all night, "Please help me, I'm shot and can't move." Our Lt. said not to try to go help him as it might only be a ruse to get us near him to shoot us. He said it was one of their tricks. After going through Liege and Viviers, we came to Malmedy, which was on the edge of the Hurtgen Forest. That had been the Ardennes of W.W.I. At some places, the trees were planted so close together that you could not see 10 feet in front of you. I remember one time we were advancing only a few yards at a time. There was an awful racket in the deep woods. Some bullets would ricochet off the trees and sing a lot louder than others. I found myself behind one tree and a young German on the other side of the tree. I just about pulled my trigger, but saw that he wasn't trying to shoot. He was rooted to the ground, just staring at me. I told him in German to lay his weapon down, put his hands behind his head, and slowly walk back. He did and I went on. We now started another phase of the war. We were supposed to be a spearhead outfit. We would go past an outfit holding a line, make the attack, get through the line, and then the other outfit would take over again. The 60th Regiment was called the "Go Devils" and we had a red devil on our helmets. When we made an attack and the woods weren't too thick, we would start running and yell, "Go Devils Go Go". We would shoot from the hip just to keep a blanket of lead in front of us to keep them down. We got what we could as we ran past and left the rest for the men coming behind us. After that we went back to another part of the holding line and rebuilt our outfit. After crossing into Germany, the first town we entered was Roetgen. We moved up to it with a battery of heavy artillery, 105 Howitzers and 240 Howitzers, and a lot of tanks. I felt very uncomfortable walking next to the big guns and tanks as they drew too much enemy fire. When we were a few miles from the town, the artillery dug in and we went ahead with the tanks. About a mile from town, the tanks stayed back and we moved in close. Then all hell broke loose with the artillery and tanks firing on the town. We moved in and we were told that it was the first town the Americans took on German soil in W.W.II. him if he realized that the Germans were only a mile away. To my surprise, the Col. did not stop them. I then asked him to have his jeep driver take me back to my own outfit, which I was really glad he did. By this time, I was getting treatment for trench mouth whenever I had a chance to go back to Battalion Aid. When the 9th Division became a spearhead outfit, we became known as a black-out outfit. They were not allowed to use our identities in the news or even in the Stars and Stripes (the military newspaper). But my brother Pete was watching a movie one day in his barracks in England, and saw me in the fighting. Pete stood up and shouted, "That's my brother!" Later on he asked them to run the reel again so he could make sure it was me. Our next objective was Elsenborn. We went without any incidents that day and the next day also. We thought that we would get artillery fire on the enemy for 4 hours before we attacked, but there was none, as they had no shells left. Ironically, back home they were on strike for a 10 cent an hour raise and we had no ammunition! From that day on, I did not think much of unions in the labor field. grenades in the empty gas mask bag and carried two extra bandoliers of ammunition clips. Next I came across the Lt. and the Platoon Sgt.. Both were dead. I put on the Lt.'s raincoat, as I was soaking wet. A little later, I found a young man who had been shot through both legs and his testicles. He was in shock and wanted to know if he was hurt badly. I told him that the medics would be along soon. I had to leave him and gather the men again. We had to go forward until we could find cover. Just before we got to a ditch, another man was shot through the stomach. I saw that he would not live long, as the Germans had used a split-nosed bullet. It had torn a big hole in his stomach. Herman was a man in his late thirties and had 8 children at home. He was a Lutheran and a farmer from Wisconsin. I asked him what I could do, and he said that he would have liked to have taken Communion once more but we had no regular Chaplain in our outfit. I said I had a C-ration biscuit and water, and both being Lutheran, maybe that would do. He answered, "Yes". I said all the sentences I could remember about our Communion. I knew it was not exactly right, word for word. I gave him a small piece of biscuit and a sip of water. We said the Lord's Prayer together and he died right after that with a smile on his face. After crawling back to the ditch, I tried to calm the men. The Company Commander came over and asked me to see if the firing came from the 3 hay stacks about 300 yards ahead of us. There was a field of beets in front of us. A man by the name of Brooklyn volunteered. He had been with the outfit ever since Africa and had been wounded three times already. He crawled to the stacks in between the rows of beets and got only 50 feet before he was hit in the hand. The next man had his trigger finger blown off. The third man was shot in the shoulder. Just as I decided to try it, the Commander came back and halted us. A bazooka team had come up with phosphorus shells and set the hay stacks on fire. There were mortars in there. W.W.I. That is where all the firing had come from, but the Germans had retreated into the town. A branch of the trench went under the Autobahn and into the town. It was a fight from house to house all the way. Our Company B had the rear of the street and Company A had the street sides. We used up every grenade we had throwing them into hay lofts, sheds, back windows, and door to door. I was glad when we got to the other end of town, as we had only clips in our rifles left and nothing else. I had 11 men left. That night the Commander told me that he was putting in my name for the Bronze Star for that day and he made me Tech. Sgt.. The next day we got word to rush back to Malmedy as the Germans were infiltrating our lines dressed as G.I.'s. We had to go back to the part of the line held by the 88th Regiment. They had been badly mauled by several German attacks. They sure learned in a hurry. We were spread out by then as we had so few men left. The whole Company was only the size of a platoon and the other battalions were just as bad. Our replacements came the next day. The next two weeks we trained those men in actual battle conditions. We took them on reconnaissance patrols and combat patrols. After they became fairly good patrols, we took them up to the German lines without being detected and watched the movements to see how strong they were. The Germans were building up more than usual. So we went back and got ready for them, adding mines to the minefields and stringing grenades into trees in front of us at various depths. I had 9 grenades in front of my foxhole with a string to each pin as did the other men. The next day, they came just when day was starting to break. We let the first wave come all the way through past the last grenades and pulled half the strings. We used our rifles on those in front of us. They waited about an hour and the second wave came. We did the same thing again with the balance of the grenades and after that, they retreated. Some of them died in the minefield in their haste. They did not bother us again for a while and this was a Panzer Division. That had hurt them a lot. One time when we were in the outpost, my Platoon was surprised by a German patrol at night. We were in our dugouts with logs piled over them. They looked like they were only piles of logs, but they were piled so that we could take them in and out for firing. We did not want them to know that we were there, so we laid quietly for a while. They sat on the logs and tapped their boots on the logs to warm their feet. The Staff Sgt. had to go rather badly, but I told him to hold it. He couldn't and then we were afraid the odor might give us away, but they finally left. Another time a German came to Battalion Command Post and wanted to surrender. The Co. said we couldn't take prisoners as we could not spare anybody to take them to the rear. He told the 1st Sgt. to take him out and shoot him. The Sgt. refused and the Commander did it himself. A few hours later, the German was back again as the bullet had only grazed his head. The Commander took him back again and finished the job. That Commander was killed in the next attack. Once when we were on patrol, we walked into a minefield. One soldier stepped on a mine and had both legs blown off at the knees. He was in such shock and scared that he picked himself up and ran back on his stumps about 50 feet before he fell again, leaving a red trail in the snow. We were all rooted to our positions and then backed out of there in our footsteps. The medics were unable to save him. Another time, a soldier came out of his foxhole to answer nature's call. As he sat on his haunches, a shell came in and exploded next to him, blowing off one of his rear cheeks. He lay on his stomach for three days with that large open wound. All the medics could do was put on sulfa powder and give him penicillin and morphine shots. After that, they were able to carry him out of there. I don't know if he made it or not. At one time in our attacks, we found an old cannon from W.W.I with three skeletons around it. We could not make out any I.D. 's, only a button from a U.S. uniform. There will probably be bodies from this war that will never be found. beer, but it didn't taste too good as it was at room temperature. While in the pub, I discovered something new. In Belgium, they don't have separate bathrooms for men and women, and they have open toilets in the streets with only a 3-foot wall around them. In the pub, there was a row of toilets only about half the height of ours. I was sitting in one feeling great, as I hadn't been in one for months. In walks a woman who sits next to me. I was a very red "Red Devil" then! Then a man came in followed by another woman. I was so embarrassed that I just sat there until they were all gone. When I got back to the boys, they just howled and dashed for the bathroom after I told them what had happened. Later when we were walking down the street, I saw a watch repair shop and went in. I asked if they could clean my watch which was full of sand and had been wet several times. He couldn't speak English very well, but he called upstairs for his daughter who was about 15 years old. She spoke good English and I left my watch there. We talked with them for a while. The man and his wife would ask questions and the girl would translate them. They wanted to know so much about America and asked us if we would have supper with them. They wanted us to meet some of their friends (Leon and his girlfriend) and then go to the dance with them in the evening. We agreed. I waltzed with the mother, daughter, and Leon's girl. Leon was a textile salesman and after the war, he sent me enough yarn for a suit for me and a coat for El. We slept in the barracks and enjoyed a soft mattress. The next day we went back to Malmedy for our next assignment. Next came the siege at Aachen. It was a hard struggle to take that city. The 9th Division was given the job of getting to the main highway a few miles from Aachen and stopping all enemy traffic going in and out of that city. It was a big highway which went through a thick forest. No vehicles could travel through the wooded area except on that road. Again we started off just before daybreak and passed through the outfit that was holding the line just a few miles back from that area. As soon as we passed them, the shooting started. We gave our "Go Go Devil" yell and started to run. I had a hard time staying ahead of those young soldiers as I was 10 years older than most of them. I was 32 years old at the time. The first one to be shot that day was a man who should have been back in the States. His IQ level wasn't very high, but he wanted to fight. He was shot in the neck, but was able to run to the rear to get help from a medic. Finally, our Company fought to the edge of the road and then crossed it. The Battalion Commander set up headquarters on their side of the road. He kept Company A and Company C around his headquarters and placed Company B (us) alone on the other side. It was a thickly wooded area when we moved in, but ten days later after Aachen was taken, there were only tree stumps. The trees had all been felled by shellfire. We had a row of rifles (from men killed there during the ten days) piled like cordwood between two tree stumps. The pile was about 3 feet high and about 25 feet long. There were times when I didn't even get the names of replacements before they were killed. They didn't have a chance to get into a foxhole. We were two men to a foxhole and one was awake at all times. After the second day, we discovered that we were dug in very close to a bunker from the Siegfried line. They sure killed a lot of soldiers from there. That night we drove them out of there with smoke bombs through the vents. The next night we were chased out, but the third night we took it again and sealed off all the vents and sealed the firing holes with rocks. We couldn't use it effectively anymore, but at least they couldn't keep killing us from there. I had to go back and forth several times a day to Headquarters and got used to the rifle fire. The sound of bullets didn't bother me so much anymore but I could never get used to the shellfire. The sound of those shells coming in and bursting scared me all the time. We had one young recruit in a foxhole near the end by the bunker. That poor guy was so scared that he never stopped digging. He was down over 6 feet when I looked in on him after an attack of shelling. He was sitting in the bottom of his foxhole with his chest blown off. the shells dropping all around us. I was covered with dirt from where the shells near me had burst, but no one was hurt. We took 10 bandoliers over our shoulders and hurried back. It was safer at the front, believe you me! We also once again lost our Company Captain and Platoon Lt. at Aachen. After Aachen, we went back to the Malmedy area to regroup for the next assignment. Our next objective was the Schmidt Dam, which was given to the 47th Regiment to secure. The 30th Regiment was to cross the Ruhr River between the dam and the town of Duren. We (60th Regiment) were to take the town and hold it. On the way, we got to a place in the woods where we had a skirmish with a forward position of the Germans. We lost our Lt. and Platoon Sgt. again. We pushed to a spot in the woods which had 3 houses with a stone fence about 6 feet high around them. One soldier walking in front of me about 4 feet away had his hip blown open from a grenade on a tree. If he hadn't stepped in front of me, I would have got it instead of him. I had just stopped to put a new clip in my rifle. it was over and I relaxed, then it all came back again. After a while, he was okay. None of the men said anything and I imagine that they all felt the same way. Around midnight, they made a counter attack. It was dark and you could see only shadows. Tracer bullets were flying all over the place and we lost 2 men in our Platoon, but the heaviest attack was on the Command Post. The Germans came all the way up to the stone wall and tried to get over. We had two machine guns trained onto the gate entrance, so that kept them out through there. Another machine gun was on the wall. One of the Germans jumped up and tried to pull the gun off. He was practically cut in half with a burst of the gun. The Germans finally pulled back. The next morning we started to move forward again, but there was no resistance as the Germans were gone. About 100 yards further in the woods, we saw long stables so we knew they were pulling their artillery with horses. They were not too far away from us as the manure was still warm. After we saw the dead, we found that we had been fighting their best Panzer Division. It seemed that was what they had mostly in this section. We fought rear guard action with them off and on all that day. The next day we came to a little town, and by the afternoon it was ours. I had dug a foxhole near a fence corner on the edge of town. From there I could see in all directions. One medic came by and asked if he could be with me. He said that he had heard of me at the Command Post. He called me Sgt. Smitty. They all called me that, even the Captain. I guess they felt funny calling me Schmidt while fighting the Germans. He asked me if it bothered me much when it came to killing. I told him that it sure did; but I'm here for the same purpose as he was, to save lives. I have to kill to save other lives. Just then we saw some Germans coming over the roof tops towards us. I started to shoot and everyone else did the same. It was soon over. Then the shells started to come in and we huddled in our foxhole. A shell came down and went into the ground about one foot from my right leg. It did not explode. The medic took one look at the hole and ran back to the Command Post. other from opposite sides of the ravine. When we got out of the woods, we came to a crossroad. There were 8 uniforms lying on the road at that corner. They were Germans and they must have been killed with a shell there. Their tanks must have then run over them, as there was nothing left except bloody uniforms rolled flat. We did not go much further that day. The next morning we took off for Duren, which was about three miles away. We took a town on our side of the Ruhr River by noon and then we crossed the bridge into Duren on the other side. We went a few blocks when the Battalion Command radioed for us to pull back to the other side of the river. The 47th Regiment was having trouble at the Schmidt Dam and the 30th was being mauled trying to cross the river, as the banks on the other side were high cliffs. The 30th finally came closer to town and crossed successfully there. The next day, the 47th won out at the dam. 1st Army Headquarters got word to us to rush back to the Elsenborn and Malmedy area as the Germans were building up heavily there. It was cold and miserable there that morning. I had dug a foxhole near the gate to the courtyard and my Platoon was all along the picket fence. I had dug the hole too deep (about 4 to 5 feet) and water was seeping in from the ground. I was soon soaked to the skin so I got a door off the house, laid rocks on the bottom, and put the door above them. It was so cold that my pants were frozen solid. When we got back to the Malmedy area, it was much colder there and snowing as it was a higher elevation. Sometimes, the Germans would test us with combat patrols. That sure helped to train the new recruits, as we had received enough of them to be full strength again. I hadn't had a Lt. for quite a while. The Captain told me that since I had been there, our Platoon had lost four Lts. and three Sgts.. He said I had been doing a good job and he would leave it that way and not ask for a replacement as yet. Every month when the liquor rations would come through for the officers, I could have what the Lt. would have received: 1 bottle of scotch, 1 bottle of gin, and 1 bottle of Calvados. When that day did come, I would go from foxhole to foxhole and give the men the gin and Calvados. I'd keep the scotch for the Non Coms. No platoon had it so good and at least it was enough to warm them all up for one night. By now the snow was deep. We would take hay and put it in our mittens, up our sleeves, and in our shoes because hay was a good heat conductor. There were times when I was so glad that the Germans did not attack, as my fingers were too numb to pull the trigger. When we went on patrol (recon), we would put on white coveralls with a hood. We would not carry anything that would make a noise or be shiny. We would carry only our rifle or B A R, one belt of clips, and a leather thong which sometimes had to be used to get past a guard. At times, it would take us half a day just to crawl 500 yards, get the information we needed, and get back to our lines. When going on combat patrol, we would try to give everyone a B A R instead of a rifle, as it shoots faster and has more bullets in the clip. We would also carry extra bandoliers. If we got past their outposts, we would do what damage we could and then back off. Sometimes we would go right through their lines, but hurried back before we would get cut off. By now it was late December 1944 and we had not bathed since the streams froze over. They brought a portable shower apparatus to a few miles behind the lines. We would go back a company at a time to get deloused. They sprayed our bodies with a powder and then we went into a tent where the showers were. We had the shower and then were issued new clothes. All this was in freezing weather and deep snow, but it felt good. Then we went back to the lines. We had orders that under no circumstances were we to retreat. It was 'go and fight to the last man' if it came to that. We always had our sharp bayonets on, but had to use them only twice: once when they overran us at night when we didn't expect them, and again in the Battle of the Bulge. One day after they had made a thrust at us, the Battalion Commander came over. There were German bodies lying in the snow in front of us. He went over and put his boot on one of the frozen bodies and said, "This is how I like to see all of those ----Germans." The Commander was ugly, mean, and fairly new to the front lines. He had two new recruits dig a large hole one day as punishment. They had joined our outfit just the day before, but he thought that their rifles should have been cleaned better. Needless to say, he did not last long. The next time we advanced, he was found with a bullet in his back. Christmas was anything but peaceful. They threw everything they had at us during December and January. Our food was always C-rations and once in a while we would get K-rations. These were better packages because they had a can of Spam instead of the hash, real soda crackers, and a bar of chocolate. We couldn't make fires to heat them, so it was always a cold meal. At times when it was quiet, I would slice the chocolate bar into slivers in my cup, fill it with snow, and stir it until it turned into ice cream. I kept on adding snow until it was fairly thick. It really tasted good. We had been in the snow all winter and hadn't slept in a house since September. By now, most of our outfit was new recruits. I had become the oldest man in the outfit after two months of steady combat. One evening, the Capt. came over and told me to take 2 of the men and go to the Battalion C O in the rear. We were to have a hot meal and one night of rest. He told me to send 3 men every night after all they had been through. All of our men had a night. I never ate so many pancakes and sausages in my life! I'll bet I had a dozen of each. Then that night, I took a blanket and went to sleep in a closet. Some instinct always told me to take the safest cover. The other two men slept in what was the parlor. That night a buzz bomb landed in the street in front of the house. The blast shattered the front window and the two men got cut badly with glass. They jumped up and ran. One of them was gray-haired in his early thirties and he had a wooden leg. But you would never have known it as he walked and ran like everyone else. They both got the Purple Heart right there at Headquarters. Once again, I was glad to get back to the lines, as it was safer there. right on top of them. There wasn't a man to be found, just a big hole. The whole platoon was wiped out, and so more new recruits had to come the next day. In late January, we finally had a mail call. I had about 25 letters. I laid in my foxhole with a blanket over me, lit a candle, and started to read. I had read only a few when I was called back to the Command Post. The Germans had broken through about 5 miles down the line and they wanted the 9th to go on down and block it. I alerted all the men, grabbed my rifle, ammo, and a bag of grenades, and left everything else in that foxhole. It may possibly still be there. Battery in the rear. He asked me if I thought it was a tank that I saw. I told him that I couldn't be sure, as there was too much shrubbery to see clearly. He then asked for the distance and I told him 2000 yards directly in front. They fired one shot, but it burst beyond about 600 yards. The next shot stopped whatever it was. They asked if they had a hit and I told them I guessed so as whatever it was wasn't moving anymore. They all let out a yell and credited themselves with a tank. lead. We brought up the rear to regroup, rest, and take on recruits. Then we leapfrogged everyday after that, but we got no rest in the rear, as the line kept on moving. The next morning we came to a small town with a brick factory. We had a hard time getting the enemy out of there. In one of the ovens, we found 3 large mailbags filled with German Marks. We did not think that it would be any good after the war, but it was. We left it there. If the civilians came back later, they must be rich by now. We then came to a railroad in the center of another town and dug in along the tracks. We were told not to shoot unless fired upon, as they thought we had managed to get in unnoticed. While on watch, a Messerschmitt plane flew along the tracks at a low altitude. I aimed about 3 lengths forward and 1 length down and fired. Everyone else started firing too and the plane crashed. The Capt. arrived and wanted to know who got the plane. I said a lot of rifles went off, but I could not say if I did it or not. I'll never know if I brought it down. One night after that, the Capt. asked me if I wanted to become a Commissioned Officer since I had been doing the work for a month. I told him that it didn't make any difference to me. He said he would put in a recommendation for a Battlefield Commission, but that he couldn't have guaranteed that I would come back to our outfit, as I would have to go to Paris for 6 weeks of training. That part was okay, but it wasn't meant to be. The next morning we took the lead again and I was hit that afternoon. We were now out in the open farm fields, no more woods. We got to a small town called Drieborn. We had most of the town taken by 2 o'clock except for a place with a moat around it. The Germans were still there with machine guns and mortars, and we took a machine gun crew as prisoners. One of them even had peach fuzz for a beard. When we got back to the Command Post, the Capt. told me to take my squad leaders and find a good spot for an outpost and occupy it for the night. I had only two leaders left, Frye and West. West was a 1st Sgt. just in from the States. He outranked me, but must have goofed off in the States because he was sent to us to be used as a regular foot soldier. I took 2 more squad leaders from Company D as a machine gun crew. We started off down the street and the shells were beginning to drop in. The machine gun crew said that they were not going with a fool that walks right into shellfire. I didn't have the time to argue with them, so Frye, West, and I continued alone. We got to a side street and saw that we covered a good area from there. The street went out at an angle from the others and we could see in three directions. Then the shells came again and always the same pattern: four corners and one in the middle. We decided to go around the pattern and return to the Command Post. Just then the 2nd Division came out of the woods at the end of the street. We had beaten them to the town by 8 hours. The Colonel in front asked me if there were any enemy left, and I told him about the castle with the moat. I also thought the shellfire was coming from haystacks about a mile out of town. He directed his tanks to take care of those two places. Then we took off, but as we got about half way back, one shell came further than usual. A piece of shrapnel got me in the ankle, pulled my leg over, and I fell in the snow. My two men picked me up and carried me back to a house and left me there while they went back to the Command Post for a medic. That was the first time I broke down and cried. We were so close to the finish and I wanted to be there when the time came. We all thought that after we had defeated the Nazis, we would turn around and finish the Russians, as they were the same type of problem as the Nazis. They had no freedom for their people, no belief in God, and the world was to be conquered in their minds. Our officers and men often talked about what would happen. Many times, I had given up all hope of coming out alive, what with all the men I had lost, what I had been through, and what I saw lay ahead of us. It seemed impossible for me to ever get back home. I had only hoped that when it did happen, it would be quick and not too painful. and tried to pull the blanket off of me, as he was cold. One of the soldiers that had carried me grabbed the blanket, covered me again, and wanted to finish off the German. I said, "No, leave him. He won't get away with it a second time." The German never tried it again after that. At Battalion Aid, the doctors asked me who had bandaged my foot. I told them it was a German medic that we had captured that day. They said it was such a good job that they wouldn't touch it, but leave it as is until I reached a hospital. When they got me in a bunk, I asked for a pan of water. I wanted to wash myself as I felt so dirty and itchy all over. I hadn't had a bath since December in that snow tent, and it was now February 4th. The medics brought me what I needed and I had my sponge bath, put on clean underwear, and slept until the next morning. Then I was put on a train to Paris and that was the end of combat for me. On the train, the pain was bearable as they gave me penicillin and morphine shots every few hours. I guess I was just happy to see the train move away from the battlefields. I was glad that I would see El again and would see our son grow up. I was wondering why God spared me, as I should have met death many times. Maybe it was because we wanted a girl too, and always thought that a boy and a girl and maybe more would make a wonderful family. As it turned out, we had just that. When we got to Paris, we were put in ambulances and taken to the hospital. That is all I saw of Paris. We did not even go past the Eiffel Tower. At the hospital, they operated and removed all the shrapnel. The doctor said that I had been very lucky. If it had gone a fraction of an inch more forward, I would have lost the ankle and they would have taken off my foot. The man in the next bed didn't want to go back to the front. Every morning he would sit up and squeeze open the bullet wound in his leg so that it wouldn't heal. of the butts and I asked him why. He said that he was making his living with them. He would cut off the two ends, put the good tobacco in a pile, and make fresh cigarettes. From Paris, we were sent to a tent hospital for a few days and then on to still another one. The one we were in was to be made into a hospital for P O W's. Then it was on to Cherbourg on the English Channel, and from there to southern England. It was a resort town, but I don't remember its name. The people from London would come there for a vacation. My papers hadn't caught up with me as yet. I was listed as a stretcher case and that is how I was transported from hospital to hospital, even though I got up and walked with crutches once they set me down. We were never issued clothing, but lived in P.J. 's and slippers all the time. There was a pub across the street from the hospital. We would go there once in a while, have the warm beer, and sit in our robes and sing. They usually gave us a back room for ourselves. I was allowed $15 a month as sick pay and the balance upon discharge. I didn't get to see my brothers who were stationed in England. Pete was with the M.P. 's and Joe was in the Canadian Air Force stationed in London. I didn't have their addresses, let alone clothes to travel in. Finally I was in Scotland and was told I was leaving for the States. We had breakfast at one in the morning and then were put on the plane. I found out that I was on a plane with all officers and I was the only Non Com. We autographed each other's dollar bills, but I don't remember what happened to mine. We got to Greenland and it was breakfast time there, so we got bacon and eggs again. The next stop was Newfoundland and breakfast time again! We flew with the sun all the way and arrived in New York at noon. We had our first hamburger in a long, long time. That night, a company in New York had a dinner and entertainment for the new arrivals. I can still remember that steak, baked potato, and whatever drinks we had. They even put on a skit for laughs, and later we went to the rooftop to view the city. It was beautiful at night. No one saw it but the tears rolled down my face. I was thanking God. How wonderful He had been to bring me back to all of this and soon I would be home. Next I was sent to Memphis, Tennessee. I was there several weeks and spent most of my time in the day room of the hospital. We played penny ante cards, as we didn't have the money to do much else. One night, three other patients and I went out on the town to have our first real night out. There were no bars where you could buy drinks other than beer. We had to buy whisky at a liquor store, take it back to the hotel barroom, and buy a set-up. Then we just sat there and drank. We each bought a bottle of Southern Comfort. We drank it all but none of us felt anything, so we went back to the hospital. I think we were too keyed up to feel the liquor. After that, we didn't bother to go to town again as we had everything we needed right there in the hospital. From Memphis, I was sent to a rehabilitation center outside of Battle Creek, Michigan. El came to see me there. How wonderful it was to have a weekend together. There wasn't much for me to do at camp, as my papers still hadn't caught up with me. I would get weekend passes from Battle Creek and go home. One Saturday, we went to a party at a friend's house. Paul Wentzlaff was back from the Pacific. We were the only two in uniform. The other men would talk about all the money they were making and all the things they were able to buy. Paul and I just looked at each other and walked out to the backyard where we sat and talked. We just couldn't get used to the way civilians were talking and thinking. We had been away from it all too long. After a while, the women came out and asked why we were alone, as after all, the party was in our honor. We told them we just wanted to be alone for a while. 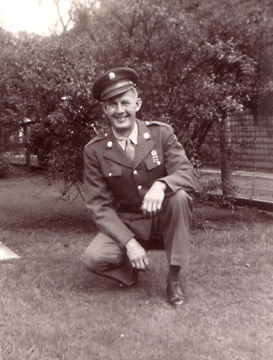 In November, I was sent to Fort Sheridan for my discharge. I had enough points for an Honorable discharge or I could have had a Medical discharge. I chose the Honorable. remembered other German faces. I saw a face looking at me with hate and another in triumph and yet another in fear. I am still restless at night to this day. I feel that I did what was asked of me, and the things related here are what I remember. Maybe all the details aren't included, but who wants to know all the little details. A lot of them are best forgotten. 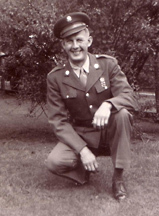 The above story, "What I Remember", by August Schmidt, PFC., 60th Regt., 9th Division, was forwarded to us by Marilyn Schmidt Westendorf, the daughter of the late Mr. August Schmidt. The story is re-printed here on World War II Stories -- In Their Own Words with the kind permission of Mrs. Westendorf. Original Story submitted on 21 July 2009. Story added to website on 21 July 2009.